This is the sixth block in a series of 12 that make the Semi-improv 9-patch quilt. All blocks are a variation of churn dash or monkey wrench, a 9-patch block. The finished block size is 12 1/2 inches. The finished size will be obtained after 2 improv patchwork iterations. Important: Keep the tiny bits when trimming the charm squares to 4 1/2 inches. They’ll be used later. 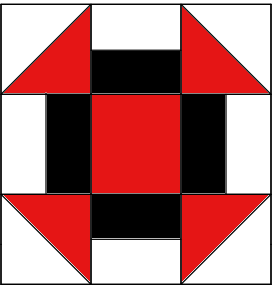 Place both pattern 4 7/8 square and background square with right sides together. Mark a diagonal as per picture. Stitch 1/4 in from the line on both sides of the diagonal. Place the cut pieces as per diagram above. Stitch together on rows and then the rows together. The sixth block is done. All 6 blocks are finished. The fun starts in the next post! It must be a glitch in the system. Is this your first subscription. I got mine in ok.